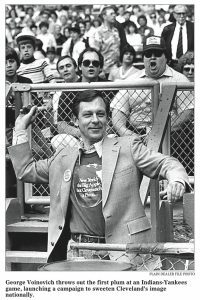 Senator George Voinovich was Mayor of Cleveland from 1980-1989, Ohio Governor from 1991-1998, and a U.S. Senator from 1999-2011. He was interviewed by Brent Larkin for Teaching Cleveland Digital on Nov 12, 2013. Cameras by Jerry Mann and Meagan Lawton, Edited by Jerry Mann. © 2013 Jerry Mann and Teaching Cleveland Digital.